When I watch the hysterically funny but poignant movie, “Sleepless in Seattle,” one of my favorite scenes is when the character played by actress Rita Wilson tries to explain to the character played by actor Tom Hanks and the other guys gathered round the table exactly why the incredibly romantic movie “An Affair To Remember” is only truly understood by women. Rita Wilson starts to repeat dialogue from “An Affair To Remember” and sets up the scenes with Deborah Kerr (is it pronounced “Kerr” or Carr? I never can remember…”) and Cary Grant. Then she starts to cry as she remembers the ending of the movie and the men are just staring at her like she’s crazy. (“Is she always like this?”) Then the characters played by Tom Hanks and Victor Garber start comparing “An Affair to Remember” to “The Dirty Dozen,” a man’s man movie about World War II. Hanks and Garber begin imitating Wilson and then start crying about scenes involving guns and bombs and Trini Lopez. It’s all very funny!!!! 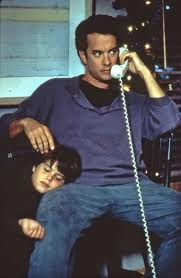 The reason my memory was jogged about “Sleepless In Seattle” had to do with a tweet I read last week from Grief Speaks. Grief Speaks tweets about loss and also is a website (www.griefspeaks.com) giving support to children, teens and adults who are coping with grief due to all different type of loss. The tweet reminded me of something some of us are all too familiar with; the poignant side of “Sleepless in Seattle” when Tom Hanks finds himself in the throes of trying to figure out how to put one foot in front of the other and go on as a newly widowed man and also as a single parent. “Doctor Marcia Fieldstone: People who truly loved once are far more likely to love again. Sam, do you think there’s someone out there you could love as much as your wife?